Guillermo Peinado sends these photos from the southern hemisphere. He writes: "I am in the city of Buenos Aires. I bought my 1946 Willys CJ2A twenty years ago. It was in good condition and I only had to paint it and repair the brakes. Since I have another car to use during the week, I only use it on weekends. I often take it to the coast. There is a beach about 400 km from Buenos Aires that I like to drive along." 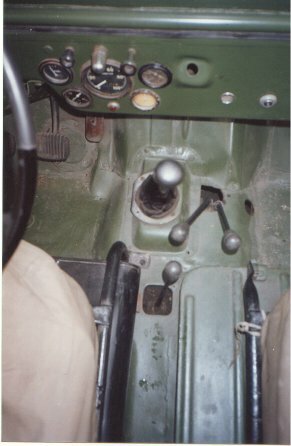 The first photo shows the interior of his '46 Willys. The hand brake handle is missing from the Jeep, but is in the owner's posession. The lever between the seats, aft of the transmission levers, is for the power take-off. 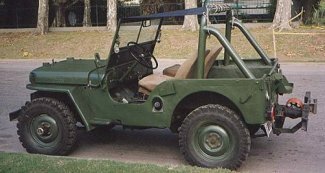 This CJ2A features a pulley for a flat drive-belt. Notice the extended bumper. It has rollers on it to keep the cable aligned so that it rolls up uniformly. The rollers keep the cable aligned with the pulley and kept it from falling off. 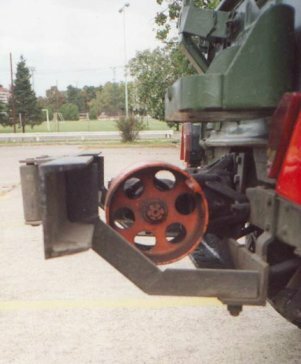 The final photo shows how far the PTO/pulley extends past the bumper.